There is this group of people responsible for making sure that singers get the best out of their songs, they are called music producers and David Foster is one of them. Foster has produced the music of dozens of the world’s biggest musicians from Michael Jackson to Celine Dion, Madonna, Seal, Whitney Houston, JLo… and the list goes on and on. Making the songs of these musicians rock have earned him much recognition with at least 16 Grammy Awards under his belt. His contributions to the music industry have also garnered him a plethora of honors including the Order of British Columbia, as well as spots in a couple Hall of Fame platforms. Here is how he made it to stardom. David Walter Foster was born on the 1st of November 1949 in Victoria, British Columbia to parents Maurice (Morry) Foster and his wife Eleanor May (Vantreight) Foster. While his mother was a homemaker, his father worked as a maintenance yard superintendent. Foster has five sisters namely; Jeanie, Maureen, Ruth, Marylou and Jaymes Foster, as well as one brother named Jaymes Foster-Levy. David Foster developed a passion for musical instruments (especially the keyboard) as a kid. At the age of 13, he got accepted into a music program conducted by the University of Washington. His escapade with music would lead him to encounter the renowned jazz musician Tommy Banks who brought him under his tutelage and taught him everything there is to know about music. In 1966, after a year with Banks, Foster had been well equipped and moved to Toronto where he began playing for American singer, Chuck Berry. Foster relocated to LA in 1974 and became part of the band Skylark formed in 1971 from one of Ronnie Hawkins’s backup groups. He enjoyed mild success with the band for a couple of years before another stint with another short-lived band, Airplay. By the 80s, David Foster had gained a lot of reputation in the music industry. He won his first Grammy for penning the lyrics to the Earth, Wind and Fire song “After the Love Has Gone.” From then, Foster began to pen lyrics for the artists he produced, taking control of composing and arranging. His wealth of experience has seen him appear on a number of music shows including American Idol, Nashville Star, Celebrity Duets, and Asia’s Got Talent. David Foster has made quite a fortune as a music producer. He served as the Chairman of Verve Music Group from December 2011 to 2016 when an in-house overhaul meant another Chairman was needed. His net worth has been estimated at $80 million. David Foster loves his women. The musician has been married and divorced four times and we dare to add “and counting.” His latest spouse whom he was divorced from in 2017 was Yolanda Hadid. She is the mother of the top models; Bela, Gigi, and Anwar Hadid. Foster began his romance with Hadid in 2002. Following a longterm relationship, they got married on the 11th of November 2011. They separated on the 1st of December 2015 and finalized their divorce in May 2017. His marriage to Hadid was his fourth. Singer-songwriter B.J. Cook was his first wife. In 1973, they had a daughter together named Amy S. Foster – a songwriter and author. With his second wife, Rebecca Dyer, to whom he was married from 1982 to 1986, he had three daughters; actress Sara Foster, comedy writer Erin Foster and the lesser-known Jordan Foster. David Foster became married to his third spouse actress Linda Thompson in 1991. Their divorce was finalized in 2005, a time when Foster was already with Yolanda Hadid. David Foster has a total of five children (all daughters) including a daughter, Allison Jones Foster (her mother is unknown to the media) whom he had in 1970 when he was 20 years old. He had given up the child for adoption but would reconnect with her when she turned 30. 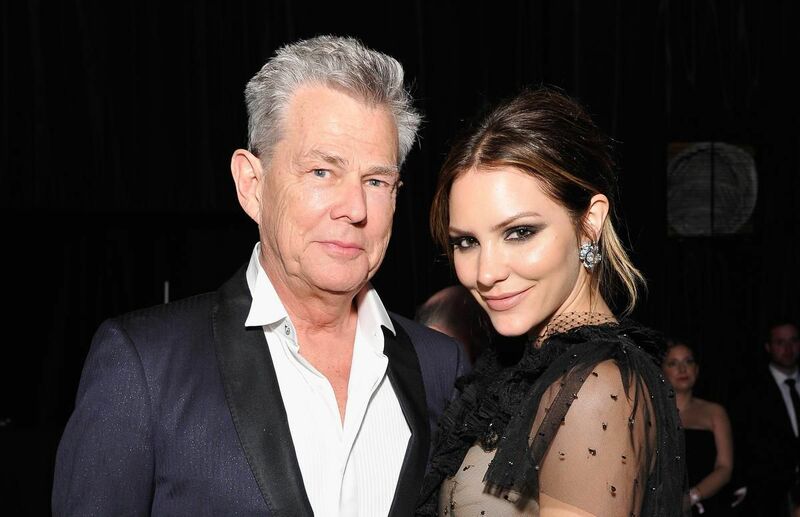 Following his split from Yolanda Hadid, David Foster began dating singer Katharine McPhee. Their relationship threw many criticisms around due to their mammoth age difference. Foster is two times McPhee’s age. The couple became engaged in early 2018 with McPhee immediately starting-off plans for their wedding. Despite the constant trolling they’ve received, the couple maintains that they understand themselves just the way they are. Foster and McPhee first met back in 2006 when he served as her mentor while she was on the fifth season of American Idol. Under Foster’s tutelage, McPhee emerged as runner-up and shot to fame after the show, thanks to her debut single “Over It” which Foster produced. The couple was not romantically involved until later. McPhee has been previously married and had other relationships. She was married to Nick Cokas from 2008 to 2016 and they were separated in 2013.